When we hear the name Lake Titicaca it conjures up all kinds of exotic thoughts. It's not only the highest commercially navigable lake in the world, but it's one of the most fascinating lakes on our planet too. Situated between south eastern Peru and the La Paz region of western Bolivia it's some 3,800 metres above sea level and more than 25 rivers of varying sizes empty their waters into this vast lake, making it the largest freshwater lake in South America. Covering over 8,300 square kilometres and with a length of over 190km and a width of 80km at its widest point, the lake is actually divided into two bodies of water by a narrow straight called Tiquina. The south-eastern section of the lake is called Lago Huiñaymarca or Wiñay Marka by the Bolivians, which means 'The Eternal City'. Perched on the top of the world, it's hardly surprising that the nights around the lake can get extremely cold however, depending on the time of the year, it can be very hot during the day. The coldest months are June, July and August so if you visit during this time, winter woollies will definitely be required. On the north eastern shore of the lake the snow covered Cordillera Real rises up to heights of over 6,400 metres forming the perfect backdrop for this beautiful stretch of water. Thought to be millions of years old, Lake Titicaca is one of the ancient lakes of the world and as such has a history which stretches back for millennia. Ruins left behind on the lake's shore and islands point to the existence of some of the oldest civilisations in this part of the world, going back long before the birth of Christ and it's known as one of the most sacred places of the Incas. According to Inca mythology, the first king of the Incas, Manco Capac made his entrance into the world here and Lake Titicaca bagged its place in Inca history as the place where the world was created when the Inca god Viracocha rose from amidst the waters around the Isla del Sol (Island of the Sun) to create the sun, the stars and the first human beings. The first steamship to set sail on the lake came all the way from England. Brought up the mountains in pieces on the backs of mules and then assembled at the lake side, it made its maiden voyage way back in 1862. Since then many commercial vessels have sailed the waters and today many ferries make regular crossings between the Peruvian town of Puno and the small port of Guaqui in Bolivia, with many smaller craft being available to take you between the islands. 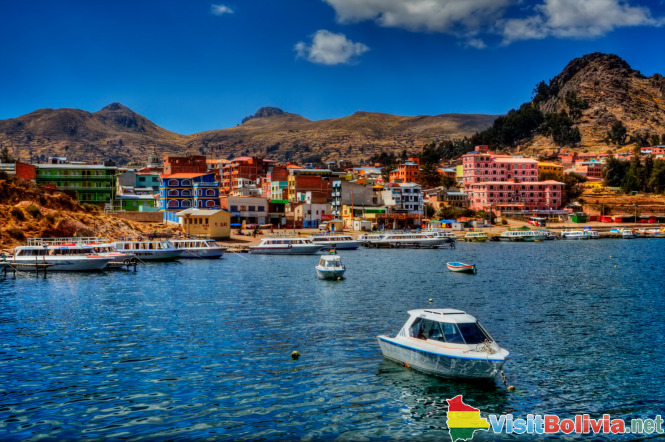 The biggest island on the lake, Isla del Sol, is most easily accessible from Copacabana on the Bolivian side of the lake. As the home of the Inca God, Viracocha, Isla del Sol plays a very important part in the history of the Inca civilisation. Although the island is fairly barren and, being hilly, rocky and completely devoid of roads, it's not that easy to get around, a visit here is a must if you have an interest in the Incas. With over 180 ruins dating back to the 15th century AD it's a great place to get a sense and appreciation of this fascinating civilisation. The village of Challapampa is home to the Gold Museum which houses many of the Inca treasures found on the island and, together with the labyrinth of Chicana and the Sacred Rock, should definitely be on your list of places to see. Just east from the larger Isla del Sol is the Isla de la Luna. Inca mythology says that this is the place where Viracocha commanded the rising of the moon. The island is also home to an Inca nunnery. 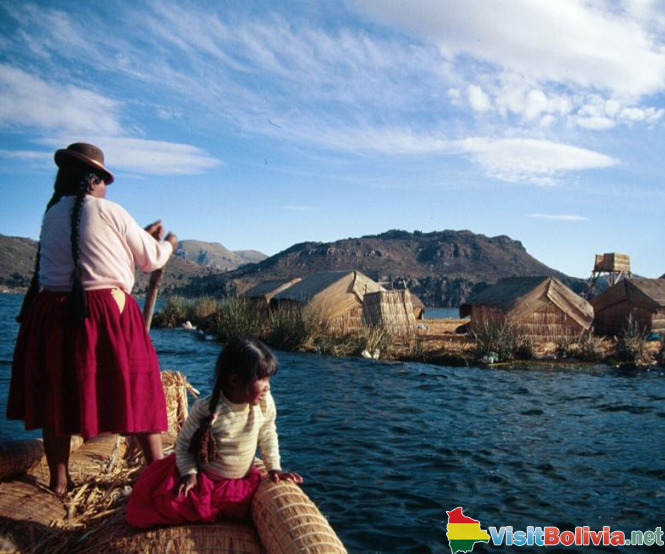 Floating on Titicaca's surface you'll find the Uros or Floating Islands. Made from reeds (tortora) which grow on the banks of the lake by the Uros People who fled onto the lake about 500 years ago, the islands are a strange sight as they float across the water. The forty or so platforms are constantly being rebuilt as the reeds rot by their population of hardy fishermen and several watchtowers built from reeds are also visible on some of the islands. Today the hospitable Uros are just as likely to make their living from tourists as from fishing, by selling a range of well made handicrafts. This island which lies in the Bolivian part of Lake Titicaca is possibly the last place on earth to utilise the ancient art of reed boat construction, with boatbuilders aiding the explorer Thor Heyerdahl to build several of his reed boats including Ra II. If you do plan to visit Lake Titicaca, be aware that visitors often suffer from headaches due to its high elevation. If this happens to you, try coca tea - it's said to be the perfect antidote.